Felicia Palma Falcone first appears at Painesville, Lake County, Ohio, in 1930. When Felicia immigrated to the United States, she joined her son, Giuseppe Falcone, in Painesville. 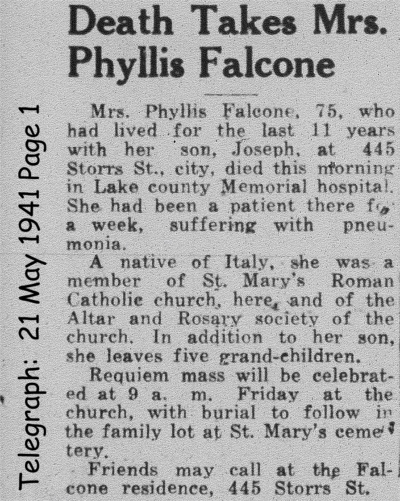 In America, Felicia Palma Falcone was known Phyllis Falcone. Felicia Palma Falcone, daughter of Giuseppe Falcone and Maria Silla, was born on Sunday, April 22, 1866, at Roccacasale, Italy. 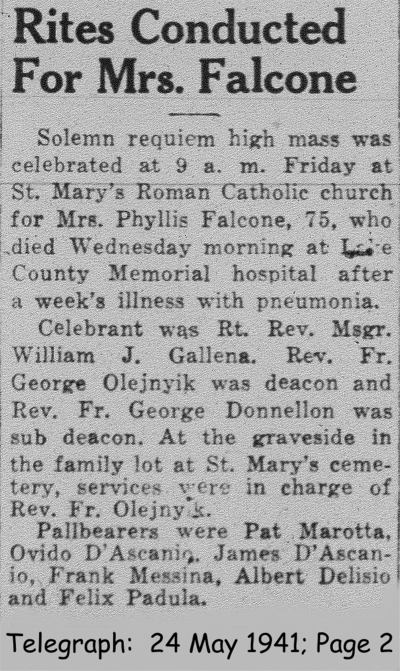 She died on May 21, 1941 at 445 Storr Street, Painesville, Lake County, Ohio, at age 75, of pneumonia. Her body was interred at St. Mary Cemetery at Painesville Township, Lake County, Ohio. Felicia Palma Falcone immigrated to the United States on February 3, 1930, at age 63, travelling to Painesville, Ohio. She was joining her son, son, Giuseppe Falcone, in Painesville. At the time of death, Felicia resided at 445 Storrs Street, Painesville, Lake County, Ohio. 1. Giuseppe Falcone was born on March 31, 1895, at Roccacasale, Italy. Giuseppe married Maria Ostoma in 1915. Giuseppe died on October 24, 1968, at his home, 560 Williams Street, Painesville, Lake County, Ohio, at age 73. His body was interred at Riverside Cemetery at Painesville, Lake County, Ohio.